Neanderthals mysteriously disappeared about 40,000 years ago, but before vanishing they interbred with another human species that was just beginning its global spread. As a result of these ancient trysts, many modern Europeans and Asians today harbor about 2 percent of Neanderthal DNA in their genomes. Curiously, some snippets of Neanderthal DNA pop up more often in modern human populations than others, leading scientists to wonder if their spread was propelled by chance or whether these frequently occurring genes confer some functional advantage. Stanford scientists have now found compelling evidence for the latter. "Our research shows that a substantial number of frequently occurring Neanderthal DNA snippets were adaptive for a very cool reason," said Dmitri Petrov, an evolutionary biologist at Stanford's School of Humanities and Sciences. "Neanderthal genes likely gave us some protection against viruses that our ancestors encountered when they left Africa." When first contact occurred between the two species, Neanderthals had been living outside of Africa for hundreds of thousands of years, giving their immune systems ample time to evolve defenses against infectious viruses in Europe and Asia. Our newly emigrated ancestors, by comparison, would have been much more vulnerable. "It made much more sense for modern humans to just borrow the already adapted genetic defenses from Neanderthals rather than waiting for their own adaptive mutations to develop, which would have taken much more time," said David Enard, a former postdoctoral fellow in Petrov's lab. Petrov and Enard said their findings are consistent with a "poison-antidote" model of gene swapping between two species. In this scenario, Neanderthals bequeathed to modern humans not only infectious viruses but also the genetic tools to combat the invaders. 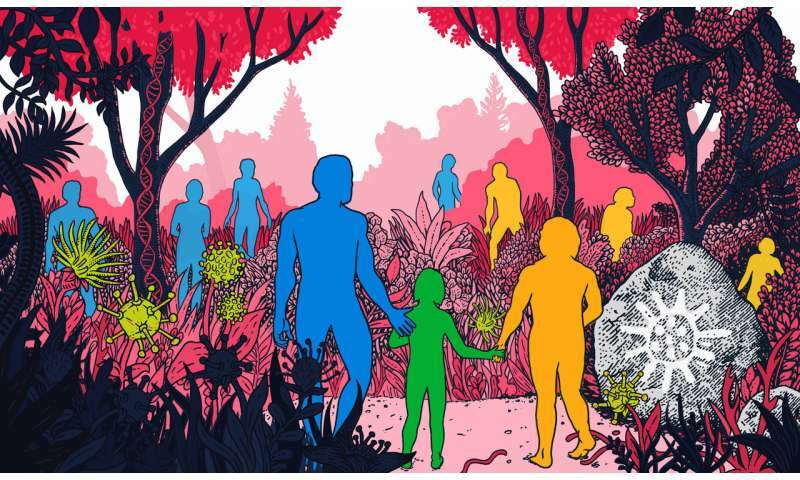 "Modern humans and Neanderthals are so closely related that it really wasn't much of a genetic barrier for these viruses to jump," said Enard, who is now an assistant professor at the University of Arizona. "But that closeness also meant that Neanderthals could pass on protections against those viruses to us." In their new study, published online Oct. 4 in the journal Cell, the scientists show that the genetic defenses that Neanderthals passed to us were against RNA viruses, which encode their genes with RNA, a molecule that's chemically similar to DNA. The scientists reached their conclusions after compiling a list of more than 4,500 genes in modern humans that are known to interact in some way with viruses. Enard then checked his list against a database of sequenced Neanderthal DNA and identified 152 fragments of those genes from modern humans that were also present in Neanderthals. The scientists showed that in modern humans, the 152 genes we inherited from Neanderthals interact with modern day HIV, influenza A and hepatitis C—all types of RNA virus. From this, Enard and Petrov concluded that these genes helped our ancestors fend off ancient RNA viruses that they encountered upon leaving Africa. Interestingly, the Neanderthal genes they identified are present only in modern Europeans, suggesting that different viruses influenced genetic swapping between Neanderthals and the ancient ancestors of today's Asians. 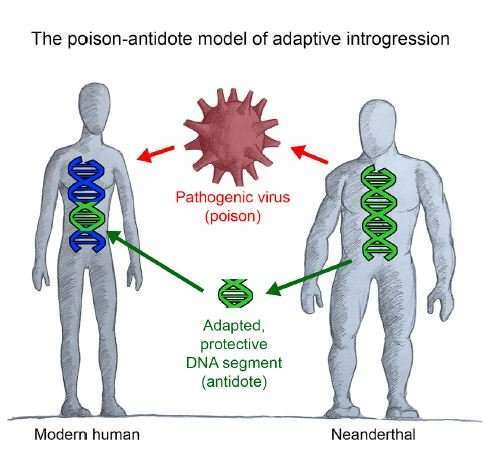 This makes sense, Enard said, since interbreeding between Neanderthals and modern humans is thought to have occurred multiple times and in multiple locales throughout prehistory, and different viruses were likely involved in each instance. In addition to offering a new perspective on interbreeding between Neanderthals and humans, the new findings also demonstrate that it's possible to comb through a species' genome and find evidence of ancient diseases that once afflicted it—even when the viruses responsible for those diseases are long gone. This technique would work especially well for RNA viruses, whose RNA-based genomes are more frail than their DNA counterparts, Enard says. "It's similar to paleontology," he added. "You can find hints of dinosaurs in different ways. Sometimes you'll discover actual bones, but sometimes you find only footprints in fossilized mud. Our method is similarly indirect: Because we know which genes interact with which viruses, we can infer the types of viruses responsible for ancient disease outbreaks." Long ago humans and Neanderthals Interbred: What happened to Neanderthal genes? Is that actually politically correct to have article with title: Modern humans inherited viral defenses from Neanderthals? Only modern humans? All people today are "modern humans", i.e. Homo sapiens sapiens. They have, by gene flow, the part of the population that have efficiently zero Neanderthals alleles today is minuscule and we can simplify by saying all humans. Also, the article demonstrates why the part of Neanderthal alleles were likely larger earlier (not helpful against tropical viruses so drifts toward extinction instead of being fixed for helping). This can't be true since people in Africa have no neanderthal DNA in them.